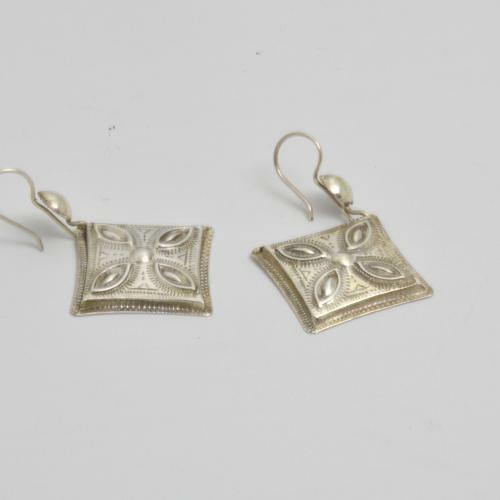 Originally these ethno silver earrings were worn as lucky charms amulets. The oval shapes on these fair silver earrings symbolise the eyes of camels. The elevation in the middle of the real silver earrings is a sand dune. The curved lines on the fair silver earrings represent crescents. The triangles on the traditional silver earrings between the eyes show the caravan map between Zender, Agadez and Bilma. The line under the triangle on the silver earrings symbolizes a Tuareg caravan track in the sand. The two dots under the triangles on the earrings are stars that show the Tuareg the way at night. These silver earrings are not only beautiful, they also tell the story of the Tuareg. By making fine silver jewellery, the Tuareg pass on old stories from generation to generation. The lines on the outside of the Tuareg earrings (real silver) show traces of centipede. Each silver earring is a hollow, welded box. This makes these beautiful Tuareg silver earrings light and comfortable to wear. Support Tuareg with the purchase of Gundara Tuareg jewellery in Niger in a very direct way.